Y.S. RANA, CHANDIGARH—Have you seen a toilet which is only used by ‘He’? The answer will be a big ‘No’ because there is a common practice and provision of having ‘He’ and ‘She’ toilets along side. But here in Chandigarh’s grain market is a public toilet built by the authorities which is only meant for ‘He’ in the open lined up using a wall. On the other, the Chandigarh Administration claims that the city will become the first smart city in the country. But hollow claims of having a clean and beaufiful city is not going to deliver the desired results when a public toilet was ‘built’ by the authorities in the most crowded grain market of Chandigarh and that can only be used by ‘He’ for urination. An open toilet has been ‘renovated’ by the Administration in the grain market along the side wall of a showroom. ‘She’ cannot use it in case of a call. This toilet is used by men in full view of public unmindful of women’s presence around. It not only stinks but with its nauseating stench makes everyone discomfortable. 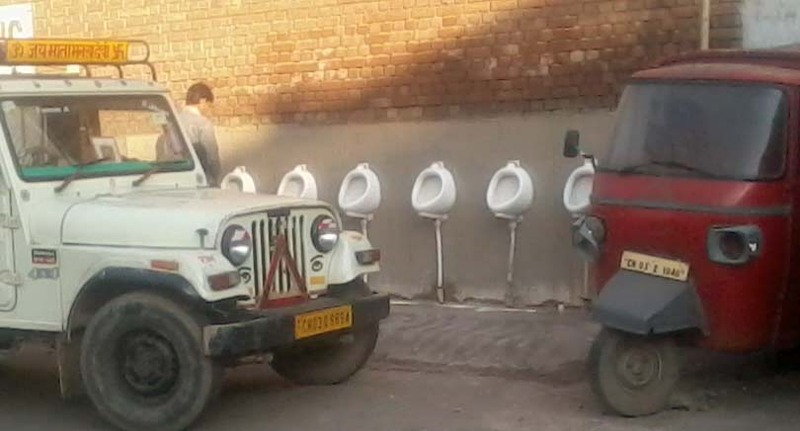 Earlier, people used the side wall of a showroom as toilet. On the objection of the owner the toilet has been ‘renovated’ by fixing tiles on the wall of the showroom. There is no provision of water and flowing urine is make the scene awkward. The system leaves the prospective smart city in disgrace.